Kana trainer I made for myself once upon a time. If you open the hiragana/katagana character lists, you can disable/enable which characters can appear for you. This way you can practice with a small number of characters at a time, so you won't get overwhelmed. Later you can include more characters, and increase the character count in order to get more proficient at reading many characters. v.1.1 (2018.09.27): Rewrote the whole program. Mainly of polishing. Answer now appears below the characters. v??? 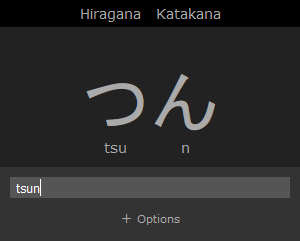 (future plans): Add composite characters, for example "きゃ" = "kya", "ろっく" = "rokku", etc. Maybe do something for Kanji.